A man known to have outstanding arrests warrants was apprehend late yesterday afternoon following a vehicle pursuit that ended with a collision. 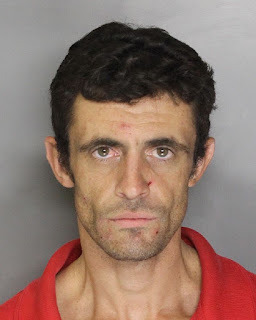 Elk Grove Police patrol officers observed a vehicle being driven by 33-year old Adam McCutchan (pictured above), who was known to have outstanding arrests warrants, on the 8800 block of Vintage Park Drive in unincorporated Sacramento County. When officers attempted to conduct a vehicle stop, McCutchan allegedly did not yield and led officers on a northbound pursuit. The pursuit terminated at the intersection of Florin Road and South Watt Ave. when McCutchan's vehicle reportedly collided with two vehicles. Officers were able to take the suspect into custody after the collision without incident. One of the driver’involved in the collision suffered minor injuries and was transported to a local area hospital for medical treatment. After McCutchan was medically cleared for incarceration at an area hospital he was booked into the county jail where he is being held ineligible for bail and faces three misdemeanor and four felony charges. Arraignment is scheduled for tomorrow afternoon.